Priced: $50.00 - $54.95 Rated: - 5 stars out of 5 by 5 reviews. Kuhl Kommando Crew - Tired of your normal wardrobe? Go Kommando and grab this great Kühl® pullover. Wildfibre™ fabric is 100% organic peached cotton that has not been genetically modified and is grown without any pesticides or chemical fertilizers. Zippered stash pocket at left bicep. Triple needle topstitch adds style and durability. Brand hits at left bicep and nape. Machine wash cold, tumbld dry low. 100% Combed and peached Organic Cotton. A stronger, softer, denser fabric. Rugged styling makes the KUHL Kommando Long Sleeve Shirt Men's the perfect sweatshirt for any mission, ready to serve “on commando” in any field of duty. mild detergent, warm water for best care. Bought this because I liked the styling, but it turns out it's more like a sweatshirt than a long sleeve tee. No matter, it is incredibly comfortable and warm. Love the thumb loops! Only downside is that the neck is a bit tight on me, but I have a large neck (18.5) so I get that a lot. Got this shirt for my husband for running. It's a really nice weight, not too heavy, not too light. Nice little zipper pocket on the sleeve for keys. Runs true to size. Just perfect in place of a sweatshirt. He liked it so well, I bought another one. Kuhl strikes again. Great style and well made. 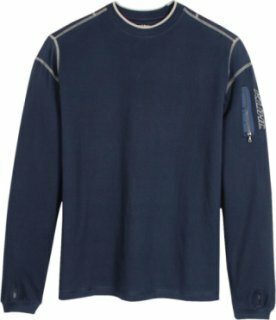 I would call it a light sweatshirt perfect for hiking or on the town. With Zappos amazing shipping a great buy. I bought this shirt for my borther in law for Christmas. He loved it! The material was super soft and comfortable. It looked great on.